Within many companies the user management is a time-consuming and lengthy process. The reason for this is that quite a lot of departments such as human resources, IT or security authorities are involved. In particular, the targeted and specialized support of an employee throughout her or his career within the organization (Employee Life Cycle) means that associated processes must be interlinked – starting with the admission to staff development right up to final retirement. The individual manual effort to create, modify and log off users and their roles as well as permissions is comparatively high. In numerous cases, it is difficult to achieve an effective collaboration between individual departments, as well as approvals from supervisors and coordination with other people or areas involved. Consequently, the onboarding of a new employee can last from days up to weeks. These tasks are recurring activities of the administration, which are mostly realized manually or by script. As a result, these processes are hardly comprehensible. As an example – it is often not documented who created which user or when, or who assigned it to a group. 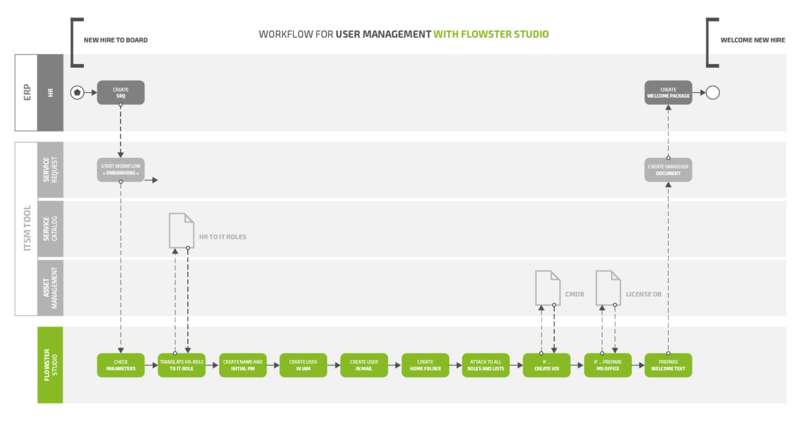 FLOWSTER Studio efficiently automates IT processes within the user administration along the entire employee life cycle. User accounts can be centrally created, changed or, if necessary, deregistered. Adjustments can be made quickly using standardized workflows, which have a direct and immediate effect on the integrated IT tools as well as systems. We are happy to offer you more precise information and advise you on the possibilities. Convince yourself and test FLOWSTER Studio for free and without obligation.